TAMPA -- In just eight months, Barry Haught and his business associates have acquired 71 properties in Hillsborough County with a market value of $8.2 million. Total purchase price according to public records: Just over $220,000. Haught's group is among a new breed of investors who have found an unusual niche: buying properties foreclosed on by homeowners associations because the residents didn't pay their dues. Given so many struggling homeowners and the abundance of HOAs in Florida, the potential for profit is great. The opportunity has attracted some unlikely buyers, among them Haught, who spent 4 1/2 years in prison for Medicare fraud and whose own home is in foreclosure. • A $1.2 million bayfront home in Apollo Beach for $10,010. • A 3,700-square-foot home in north Tampa for $8,090. • Dozens of single-family homes in Brandon and Riverview for less than $4,000 each. 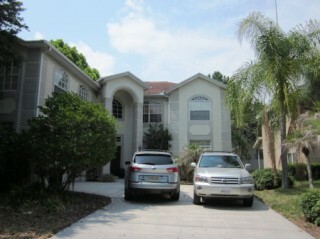 This Tampa home in Hunter’s Green sold in 2003 for $295,000. Prop Inc. paid $8,090 for the certificate of title. pocketing the income for months or potentially years until the bank finally forecloses — and they don't have to tell tenants that the lender could kick them out at any time. Sometimes, associates of the group move into the homes. Among them: Edward Pruse, 36, who did time in state prison in connection with a 1999 armed robbery of a Largo movie theater. Pruse, who said he finds homeowners association foreclosures for the investor group, now lives in a 4,000-square-foot house in Brandon that sold in 2006 for nearly $700,000. The group got title in December for less than $7,000. "We're the new way of buying and selling real estate," Pruse said. "We're an epidemic." Haught, 57, attends foreclosure auctions, signs documents and collects rent on behalf of four companies officially headed by Michael Chancey, son of Tampa marketing consultant Ralph Chancey. The Chanceys and Haught are longtime friends. In 2001, Michael pledged a Valrico home he owned as collateral for Haught's legal fees after Haught was indicted for bilking Medicare out of $14 million. And when Haught was released from prison in 2008, he went to work for Ralph Chancey's consulting firm. Haught declined to comment for this story. Michael Chancey, president of Prop. Inc., F.Y. Mortgage, F.Y.M. and P&D Resources, did not personally return several requests for comment. Ralph Chancey said he came up with the idea of buying homeowners association foreclosures after attending an auction at the Hillsborough Courthouse last year. He had read about people renting out abandoned condos illegally and figured there was a legitimate way to make money by simply buying the properties at auction or from the associations. "It looked real easy to do,'' he said. Florida has 40,000 homeowner and condo associations, many of them struggling to pay for even routine maintenance because so many owners have fallen behind on their fees. As a result, lawyers are advising associations to foreclose quickly to limit their losses. "If they don't do something to stop the bleeding, the community will go under,'' said Robert Tankel, a Pinellas County attorney who represents more than 500 associations in Florida. Homeowners associations want to beat the bank to foreclosure, Tankel said, because a bank foreclosure usually wipes out the association's lien, leaving it with no way to recoup its delinquent fees. In what Tankel calls "the race to the courthouse steps," associations have an advantage. Because most homeowners owe less than $15,000, associations can file their foreclosure cases in county court instead of circuit court with its higher dollar amounts and heavier case loads. That way the associations can get a final judgment of foreclosure in as few as 270 days compared with the 617 days it now takes for the average bank foreclosure in Florida. The time lag creates an opportunity for third-party investors like the Chanceys and Haught. Once a property goes to public auction, anyone has the right to bid. It usually costs just a few thousand dollars to cover the delinquent association dues, court costs and lawyers' fees. The winning bidder gets title to the home and can start looking for tenants. If there are no bids at the auction, the association can then negotiate a private sale with a third party. The Haught-Chancey group has acquired about a third of its properties through such transactions, in which the price paid is not part of the public records. "It's called capitalism,'' Tankel said. "It's the free market." The strategy works because of loopholes in state and federal law. The home­owners association doesn't have to notify the bank that it is foreclosing. That means the bank could lose its chance to pay the delinquent fees itself or start its own foreclosure action. And investors who buy and rent out properties foreclosed by homeowners associations don't have to tell the tenants that the bank could also foreclose and evict them. Ralph Chancey said his venture is a boon to both cash-strapped associations and people who have a hard time renting. His companies don't do background or credit checks. One tenant got the keys to a Brandon townhouse for just $300 down and $1,100 a month for rent. The landlord-tenant relationship has not always gone smoothly. Haught was arrested in May after a tenant accused him of entering her apartment and smashing a TV. The criminal mischief charge was later dropped. "We help people, but whether it's a good investment is still a flip of the coin," Chancey said. "We still don't know if we are fools or brilliant." The race to foreclose and move in new tenants has left some homeowners in the dust. Earlier this month Jesse and Natasha Fiechter fought to regain title to their home in Riverview after it was sold at auction. The couple were about $2,000 behind on their fees to South Pointe of Tampa Homeowners Association. But they had worked out a payment plan and sent their first $1,000 check to Bush Ross, the homeowners association law firm, by the due date. The firm said it hadn't received a signed agreement from the Fiechters before the auction and the sale went ahead. Prop Inc. made the $4,260 winning bid. Natasha Fiechter said she first learned of the sale when Haught stopped by her house June 2 and told her mother he was the new owner. When Fiechter insisted the sale was in error, Haught wanted $2,500 to go away, she said. "I thought, 'Are you insane?' Then I stopped answering their calls and got a lawyer." On June 20 the matter went to court and Haught appeared on behalf of Prop Inc. Judge Matthew Lucas set aside the sale and told the association lawyers to refund $4,260 to Prop Inc. The Fiechters were grateful for the resolution but shaken by the experience of nearly losing their home. Companies like Prop Inc. are "bottom feeder outfits (that) take advantage of the poor economy and a loophole in the law," said the couple's lawyer, Martha Bolton. "They're taking advantage of the fore­closure limbo." In another case, Tim McMurry, president of PowerNet Credit Union, said his staff was puzzled when a borrower who was current on his credit union mortgage called in April to ask why he had gotten a foreclosure notice. It turned out that the notice was from the man's homeowners association. By the time he realized what was going on, his house had been sold. The buyer: Prop Inc. The homeowner was just $890 in arrears to the South Pointe of Tampa Homeowners Association, but with interest, court costs, and attorneys' fees of $2,250, his total had spiraled to about $3,700. That's how much Prop Inc. paid for the three-bedroom, two-bath property in April. Prop Inc. evicted the homeowner in early May and leased the house to Melissa Wollam, her two children and her mother. The family, who saw Prop Inc.'s rental sign on a street pole, were relieved when they got a year's lease at $1,150 a month without a credit check. But three weeks after moving in, a process server knocked on Wollam's door. PowerNet Credit Union felt compelled to foreclose on Prop Inc. and the tenants to assert its right to the property, McMurry said. Wollam, who does secretarial work, said Prop Inc. never told her the house was subject to an outstanding mortgage. Nor was the potential for a mortgage foreclosure mentioned in her lease. "I was under the impression that the house had been completely purchased and everything was taken care of," she said. "My kids really love this neighborhood, and I'd really hate to move again." McMurry, the credit union's president, said he was stunned to learn that homeowners associations do not have to notify lenders holding first mortgages when the association starts to foreclose. If he had known about the delinquent fees, the credit union would have paid them and tacked the amount on the borrower's mortgage, McMurry said. The original homeowner could have stayed in the house. Now McMurry said it could take as long as 18 months for the credit union to regain the property, on which it is owed about $140,000. "In the meantime, this guy (Prop Inc.) is going to take the rents, and I'm going to get the bills for taxes and insurance,'' McMurry said. On a recent Friday afternoon, Haught was among 20 or so people gathered for the homeowners association foreclosure auctions at the Hillsborough Courthouse. Unlike Pinellas and Pasco, where auctions are conducted online, Hillsborough holds its sales in a hard-to-find room behind the courthouse cafeteria. Regular bidders don't need directions. About half of the would-be bidders left when a court clerk announced that the sale of a prized property, a Tampa home with no mortgage and less than $4,000 in homeowners association liens, had been cancelled. Nine other properties drew no interest and were taken back by the association's lawyer. When a $104,000 home in Valrico came up for auction, Haught, sitting quietly in the back row, had someone else enter the sole and winning bid: $3,842.31, the exact amount of the delinquent home­owners association dues. That's a typical purchase for Prop Inc. and its sister companies. With rents starting at about $1,000 a month, plus a month's security deposit, the company can recoup its investment in about three months. After that, the investors could be pulling in profits for a long time: According to public records, neither Prop Inc. nor its three sister companies have had to relinquish any of their homes to a bank. Apart from the Apollo Beach mansion acquired for $10,010, the most the group has paid for a property was $8,090 in May for a two-story home in Tampa's upscale Hunter's Green community. The newest occupant is Benjamin Cheek, 37, a friend of Haught's. In 2004, Benjamin Cheek, who once worked for a Virginia mortgage company, was sentenced to 57 months in federal prison for swindling a retired lieutenant colonel and his wife out of at least $250,000. From 2006 to their release in early 2008, Cheek and Haught were in the same federal prison camp in West Virginia. Pruse, the man convicted in the Largo movie theater robbery, has been living since December in the big Brandon home that F.Y.M. acquired. By buying homeowners association foreclosures and moving people into the homes, Pruse said investors gain so much leverage over lenders that they can practically name their price if they want to buy the property outright. "Banks aren't in the drivers' position anymore," Pruse said. "The HOA's attorneys love us because they get paid (when we buy). But once we get in, the HOAs hate us because we control who moves in and out. They want 'pretend millionaires' instead of working-class people or a woman with nine children." Asked how long he expected to be able to stay in the home, Pruse laughed.